* Shipping costs showing NOT ACTUAL COST in most cases. * Contact Us for an ESTIMATE. Item may qualify for Shipping Options LESS EXPENSIVE not available within the listing, such as Flat Rates. * All items ship insured. FREE Shipping Insurance if shipped Priority Mail up to a $50 value, ONLY. All others Insurance cost will be added. * International Shipping. Add cost: Registered Mail, Signature Conf, & Insurance. * Combined shipping NOT offered. * UNDERPAID actual Shipping Cost: Item will not be shipped until balance owed is paid in full. * OVERPAID actual Shipping Cost: Seller will reimburse Overpaid Sh&h balance (Buyer paid what showing in the listing but the actual Shipping Cost happens to be less). * Returns imply an added Shipping cost to either the Buyer or Seller, is time consuming and an inconvenience for both parts. * Items are thoroughly described, pictures are posted. Buyer may request more pictures, and may ask questions to the Seller BEFORE deciding on a purchase. * No returns will be accepted due to a Buyer's change of mind or because did not like the size, material, or color for e.g. * Therefore, we only accept returns for a full refund (including Sh&h) if we have made a mistake in sending the Buyer the wrong item. Contact us first for a Return Approval. No exceptions. * Damaged item by the Postal Service is not to be returned. It shipped insured, so contact Seller for assistance to fill claim online for a full refund. * MY HIDDEN DRAWER store offers an array of items for adults & children, from indoors to outdoors, for the home, office, or personal use: designer bedding, kitchenware, bakeware, dinnerware, flatware, glassware, tableware, fine china, decorative items, gift giving, books, collectibles, one-of-a-kind, accessories, clothing, toys, crafts, art, Christmas, Holidays, sports, memorabilia, music, electronics, new, vintage, antiques, discontinued, hard-to-find, special editions, photography, authentic designer brands, you name it! * That is, a little bit of everything. Everybody will find something that needs, had in a wish list, or to give as a gift. * We do research on every item offered & we stand behind what we sell. This edition is written in Italian, which has been translated from its original version written in French. 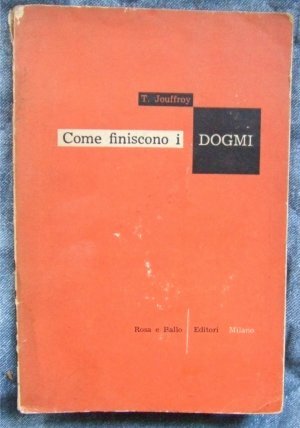 Questo livro e scritto in Italiano. E stato tradotto dello originale in francese. E stato scritto nel 1823 e pubblicato in un supplemento di Le Globe in 1825. In 1841 was published again by Pierre Leroux as a Manifest that included a very strong comment in opposition to Jouffroy himself. In 1841 Pierre Leroux lo ha pubblicato nuovamente, come Manifesto, con un commentario violento in cui opponeva Jouffroy a se stesso, nel primo fascicolo della Revue Independante. "Le Cahier Verte" was written between 1820 and 1836, and published for the first time by Pierre Poux in 1924. E una raccolta di pensieri scritti in epoche differenti (scritto tra 1820 ed 1836). Questo manoscritto venne pubblicato per la prima volta da Pierre Poux in 1924. Queste lettere fanno parte di una breve serie indirizzata a Charles Weiss (1779-1866). Condition/Condizione: Used. There is no highlighting, no writing, and no underlining of text on pages. Cover's condition with overall shelf wear; and some pencil/pen writing and water mark soiling on back cover which also bears a small torn piece by upper edge. Therefore, a few of the last pages have a soft soiled mark by the very lower spine's corner edge. Binding is sewn but front cover has become partially detached on upper portion by the spine. Pages have become brownish around edges, and a few aren't detached but look as though they won't withstand staying attached with further continuous handling. Questa copia e un libro usato, e le pagine non sono state scritte ne sottolignate. A una macchia come d' aqua visibile nell reverso e in alqune pocche delle ultime pagine nell' angolo inferiore. Manca un pezzetino di la coperta nel reverso. Le pagine sono cucite, non ostante qualcune pare di venire sciolte col uso futuro . Le pagine sono diventate un po marrone. Sull reverso de la coperta ci sono manoscritte quelche parole ed un numero. ISBN: not available at time of this publication year. Please, feel free to contact us with your questions. Thank You.